The dusty, faded shoe box was crammed under the workbench. In the midst of de-cluttering fervor my friend said, “Take it home, I didn’t know it was there and I haven’t missed it.” I felt like the Indiana Jones of Garage Archaeology! It was a small memoir encased in cardboard; inside were a number of small items tucked into old jewelry boxes. But they weren’t just objects, each has its own story and some will be sent on to a family member. This forgotten collection started me thinking about ways you can use the “stuff” you’ve saved as prompts for some personal history work. It’s a great place to begin, especially if you’re stuck on a project that seems too big. Where to start? Problem solved! Whether it’s a box of photos, a collection of tools, buttons, coins, books, recipes, or just “stuff” use that eclectic collection as the basis of your personal history. The story of these items and why they are/were important can be easily turned into a standalone chapter or even become the start to an entire personal history, you decide. Gather the existing collection—the how, why, where and when of its existence is a great launching point for your story. Get a medium sized box—begin placing things in it that prompt your memory, either about yourself or the person whose story you are writing. This is an extremely effective step as it helps you recall things you thought you’d forgotten. As you select items for your box keep a running note going about the memories associated with it. Ask family members and friends to contribute to the memories surrounding the items in your stash. They may even have an object to contribute, like a photograph or old letter. Add to your notes as more memories come to you. If the stash belongs to someone else, interview them. Remember to look at the backgrounds in the photos, the postmark and paper of the letter, the gravy stains on the old recipe—the charm is in the details, take your time. This is important—don’t skip this step. Sit and mull the contents of your box with your notes and/or a recorder in hand. If you’re telling someone else’s story, interview them. Be specific and handle each item in the box, taking your time. If you consider yourself a non-writer, record your thoughts or have a friend write or record while you sift through the objects. Now, walk away from your box of goodies. Come back to it in a day or few and see what else your mind has recalled since you last spent time together. There will be more, I guarantee it! Look for a theme—are the photos all of family events? Are they important historically? What was going on in the world at this time? Does a collection of letters tell a great love story? Does it chronicle the preciousness of an ordinary life? Is it a travelogue? If you are having trouble seeing the theme, a rare occurrence, ask a close friend or family member to look through the box with you and tell you what they see. What stands out? You don’t need to write about everything to tell a great story. Some of the best stories ever told are just a snapshot in time, one event, one object. If you’ve always wanted to tell your story but have felt overwhelmed, start with these 5 keys and begin. You’ll soon have a powerful, condensed collection of life memories. Then, voila! You are unstuck and have given yourself the gift of making progress. A beautiful example of a short memoir, written by Carlos Lopez, Las Cruces Sun News reporter, a few days ago. Happy Birthday, Isabel! Include the details about cookies, education and life lessons in your story, just like he did. MESILLA PARK – A life devoted to working hard and maintaining a strict diet of fresh food has paid off for longtime Mesilla Park resident Isabel Valles Uribe, who celebrated her 105th birthday last week surrounded by over 150 family members and friends. “Trabajè todo mi vida muy duro (I’ve worked hard all my life),” Uribe said Tuesday while sitting in the living room of her Mesilla Park home, where she and her late husband, Concepcion Uribe, retired after operating a general store in San Miguel from 1947 to 1972. “My mother is very loving and patient — it’s amazing,” her daughter, Flavia Pavia, said. Isabel was born in Artesia on Sept. 27, 1912, about eight months after New Mexico became the 47th state in the United States. Her parents were Jose and Tomasita Valles, and she was the eighth of 16 children, according to Pavia. At age 10, Isabel moved from Artesia to Vinton, Texas, with her parents and siblings, Pavia said. The family then relocated to the southern Doña Ana County community of La Mesa in 1924 and later settled in nearby San Miguel in 1926. Pavia said her mother never attended school as a child but taught herself to how read and write in English and Spanish. Isabel spent her childhood helping her mother care for younger siblings, and later worked as a field worker, picking cotton and peas. In 1935, she married Concepcion. The following year, Pavia, the couple’s first child, was born. They also had two sons, Homero and Renato. The Uribe family lived in San Miguel, where they opened Concho’s Mercantile in 1947. After retiring in 1972, the couple relocated to Mesilla Park and spent their retirement traveling to places such as Mexico City and other areas, Pavia said. Concepcion died in 2003 at age 95; their son Renato died in 2015 at age 75. In addition to three children, they have 14 grandchildren, 24 great grandchildren and seven great-great grandchildren, Pavia said. Today, Isabel enjoys relatively good health — something she and her daughter attribute to a lifetime of working hard and eating right. She’s also been making homemade tamales for many decades and still helps spread fresh masa on corn husks when making them with her daughter. She stays active with housework, tending to her six chickens and playing the board game Rummikub. Over the past weekend, she celebrated her birthday with large party at a church with more than 150 people in attendance, Pavia said. “Ever since her 100th birthday, we’ve celebrated really big,” she added. One her gifts included a certificate of recognition from Gov. Susana Martinez that was delivered to her home on Monday. “I wish you many blessings and hope that special day is celebrated with the love of family and friends,” Martinez’s certificate states. She and her youngest brother, Cleto Valles, 87, are the last of their siblings still living, according to Pavia. “We keep saying, ‘Thank God we have her for another year’ — that is wonderful,” she said. Heads up–not many of us are blessed to live to 105, please don’t wait. Now go, be inspired, and write your family’s stories. You can do it! My son calls me the “Skunkinator.” Several nights ago our cat, Fudge, came in for the night, bearing the residue of a recent close encounter with a skunk. Fed up, next morning I trudged off to the neighbors to borrow a humane live trap. Jack and Martha have lived out here in the country for 25 years and know a thing or two about skunks. I was about to be schooled. Thursday night, I carefully set the trap. Friday morning—nothing. I baited the trap again with a delectable half-serving of peanut butter sandwich, complete with homemade jam. Jack had claimed this would work and I was hoping word about my devious plan had not leaked out among the skunk community. Saturday I forgot about it and went out to dinner with my husband on a long overdue date. Sunday morning, while getting ready for church, I looked out the bedroom window to see Fudge sitting by the trap intently watching a black and white something trot around inside. Our other cat, Socks, matches that description so I thought she’d become a little too curious and been nabbed. Looking again, I yelled, “I got a skunk!” and dashed out the front door in my bathrobe. Shooing the cat away with difficulty I cautiously approached the trap from behind a tree and observed a very nervous, very small skunk corralled inside. At this point I realized something about live traps. They come in different sizes. This one was designed to contain a full-sized skunk, preventing it from lifting its tail and deploying its defensive mechanism. Jack hadn’t mentioned the size issue. My skunk had room to do laps and set up housekeeping. I retrieved an old rug from the rag box, mentally rehearsing what I knew about skunks. 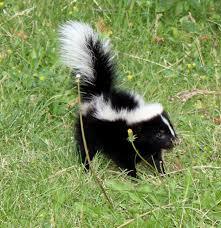 Number one fact being that skunks won’t spray what they can’t see. My delighted children all trooped out to watch the spectacle. Informing them that I would be releasing Missy Skunk up the river, I busily made plans for dropping her off and making it to church, deciding that in the interest of time I would get dressed first. Garbed in my best pantsuit, I did my hair while my husband proceeded to tell me what nice pets skunks make and did I think the neighbors would mind? I was oblivious to the sly grin with which he delivered this bit of information. My hair still up in rollers, I carefully held the old rug in front of me like some motherly matador in high heels as I tried to approach the trap without upsetting the skunk. It didn’t work. Small spritzes of cologne-like delicacy let me know that was close enough, thank you. In that last mad dash to throw the rug over the trap my nose must have gone into olfactory overload. The odor honestly didn’t seem too bad at the time. Carrying trap and all at arms’ length, I carefully deposited it in the back of the pickup then headed inside to wash my hands, breezing by my family, who were all ready and groomed for church. They speedily informed me that I “stunk” and needed to change my clothes. Five minutes later I handed the offending duds out the door to my snickering husband, put on old clothes and prepared to finish the job. We drove Missy Skunk five miles up the river and released her in the thick willow breaks, feeling good about ourselves. She left with one parting defensive salute and never looked back. I sat at the back of the church that morning in a faint cloud, considering that the good Lord who made both skunks and mothers had taught me something about getting carried away with multi-tasking.